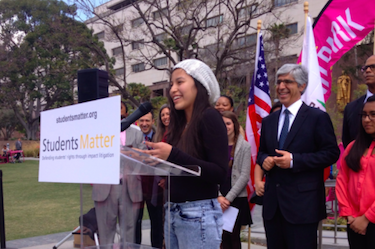 The non-profit group behind the Vergara lawsuit, Students Matter, went on the offensive today against three bills introduced recently in the California legislature that the group says are “anti-Vergara” as well as unconstitutional. The bills, AB 753, AB 575, and SB 499, all work in direct opposition to the landmark Vergara v. California decision, Ben Austin, who leads policy development and advocacy for Students Matter, said on a conference call with reporters today. “We are seeing bills debated on the floor, like Assembly Member [Jose] Medina‘s bill, and we see Assembly members who are wholly uneducated about the constitutional, legal and moral implications of the Vergara decision,” Austin said. In the Vergara decision in June 2014, Los Angeles County Superior Court Judge Rolf Treu struck down California’s laws regarding teacher tenure, layoffs and dismissals by saying they deny students access to a quality public education, especially those from poor and minority families. In essence, Treu ruled that it’s too easy for a teacher to get tenure in California, too difficult to fire a bad teacher and too harmful to students to base teacher layoffs on seniority. The state’s two largest teacher unions, the California Teachers Association (CTA) and the California Federation of Teachers (CFT), and the state, all defendants in the case, have appealed the ruling. Treu’s ruling leaves the ultimate remedy to teacher employment laws to the legislature, and the lower court decision will not be implemented unless it is upheld by the appellate court. Austin insisted that Vergara is still the “law of the land” and that the three bills Students Matter is opposing are unconstitutional. AB 753 looks to expand tenure to teachers in districts with 250 employees or fewer, where it had traditionally not previously been extended. Medina’s office did not respond to a request for comment. The two other bills deal with amended rules regarding teacher evaluations, but Austin said they were problematic because they grandfather in an “unconstitutional” system, even though the Vergara ruling did not cover teacher evaluations. “Evaluations were not technically at issue in the Vergara trial, but…. just about all of the legal and policy theory implicate it in the Vergara trial,” he said. Austin also pointed to a recent USC-Los Angeles Times poll that found the majority of registered voters in California support the major tenets of the Vergara ruling and want to see a longer term for teachers before tenure, an easier system to dismiss underperforming teachers and a layoff system that does not only factor seniority. “Nobody supports the current system except for CTA and their close allies,” Austin said.